There is something about ancient Mesopotamian jewelry that sets it apart from any other in antiquity. That something is more than just a distinct style or taste. Mesopotamian jewelry was a large artery in the anatomy of each civilization that rose in the land between the two rivers, and its story is one worth reading. Jewelry wasn’t a new concept when Sumerians got their innovating hands on it around 2750 BC, but their innovations made their jewelry, produced from that point to the Assyrian period, around 1200 BC, seem like it was an entirely new invention. In fact, scholars and jewelry makers today look to Sumerian work as the progenitor of modern jewelry. 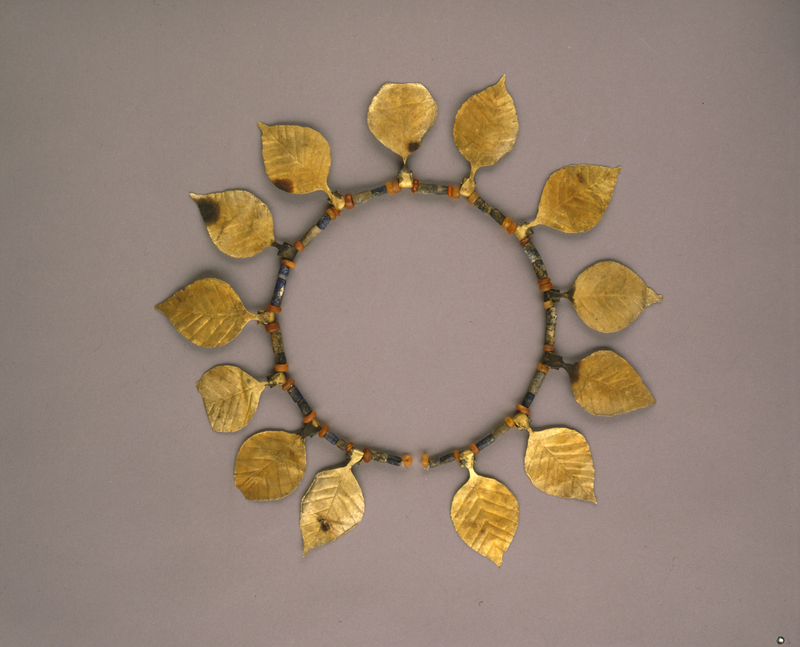 Of course, jewelry served as a status symbol in Mesopotamia as it always has everywhere else, but it also played a significant role in how the Mesopotamian civilization functioned. 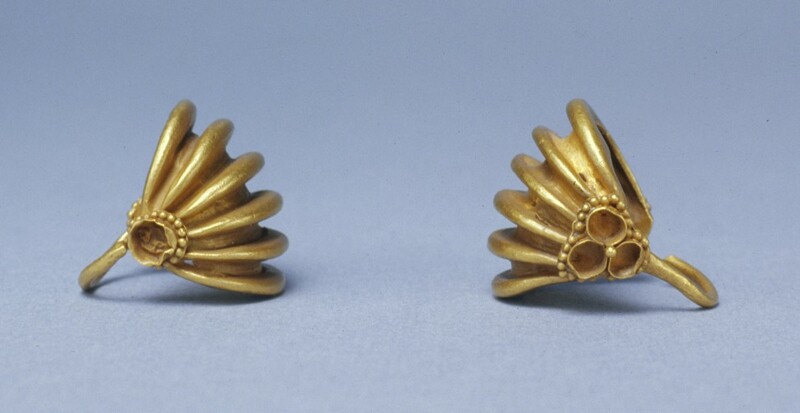 Let’s begin the journey to understand ancient Mesopotamian jewelry. 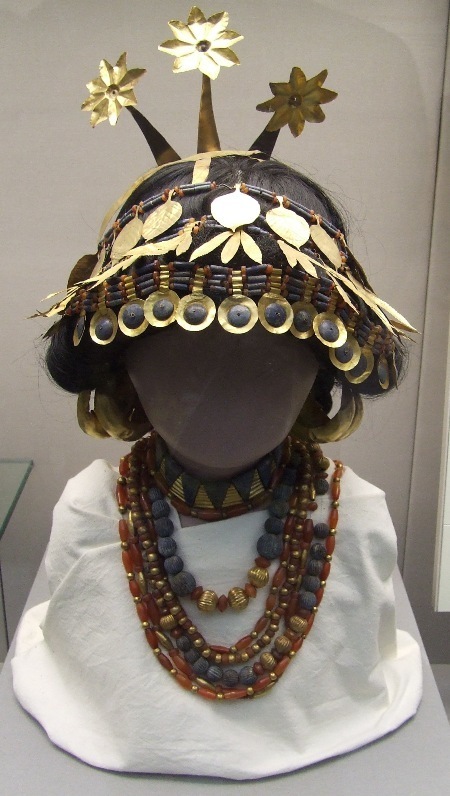 It goes without saying that jewelry served as a status symbol for noblemen and noblewomen, and royals, in Mesopotamia. Royals were buried with theirs, like Queen Pu-abi at the royal cemetery at Ur. The lavish royal tombs of Ur, along with those at Nimrud, are considered the most significant finds in the study of ancient Mesopotamian jewelry, because they held a lot of it and have helped explain the types and their uses. The three tombs at Nimrud alone held some 1500 pieces of jewelry, weighing a total of 100 lbs. 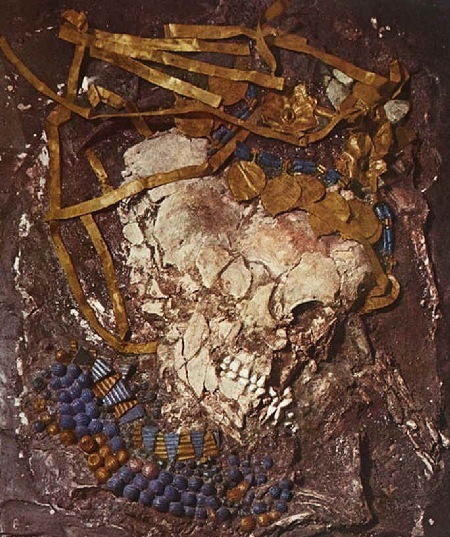 At Ur, some 17 tombs were excavated, and they were simply loaded with jewelry. Jewelry was also a fail-safe wedding gift, as well as a commodity used in dowries and inheritances of the upper classes. It was used as a tool in diplomacy, but was also the subject of war under the heading of wealth. 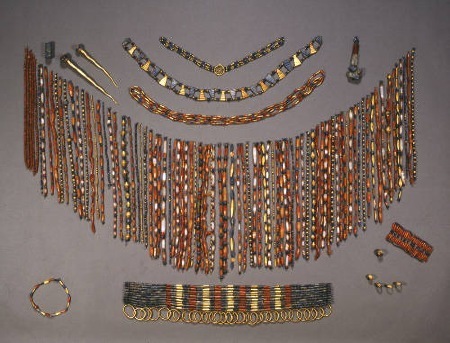 Some of the jewelry unearthed in Mesopotamia is loot from military campaigns, mostly during the Assyrian period. Jewelry was also offered to the gods at temples, and the practice of being buried with jewelry was a person’s attempt to go to the afterlife bearing gifts to the gods. Mesopotamians adorned their statues and idols with jewelry to further clarify it as a spiritual and/or magical tool. Bloodstone was worn by Babylonians for protection against their enemies and was also used in divination. Wedding bands, as we know them today, in precious metal form, also got their start in Mesopotamia. They were only worn by women, and they communicated what is considered to be, well, a little less romantic message than ours, that tells of a woman’s status as someone’s property. 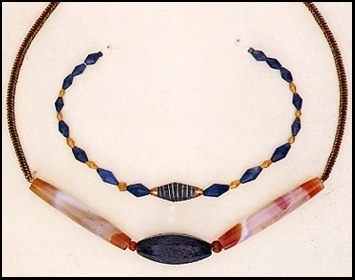 The materials used in Mesopotamian jewelry were the basic copper, gold, silver, and electrum, along with the not-so-basic gemstones like agate, carnelian, chalcedony, crystal, jasper, lapis lazuli (which was valued higher than any other material, even gold), onyx and sardonyx. Also used were shells and pearls. These materials were used to make jewelry designs featuring stars, rosettes, leaves, grapes, cones, spirals and ribbons. Cylinder seals were also used, but were made by seal makers, separate from jewelers. 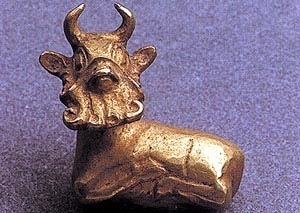 Modern jewelry experts have dubbed Sumeria the cradle of the goldsmith’s art. It is important to understand that although the Mesopotamian civilization was beyond rich in food production, thanks to its location on the Fertile Crescent, it was still a land of few resources. Metals and stones to make precious jewelry were especially scarce, necessitating what eventually shaped up to be an entire economy, based on the import of raw precious materials and the export of finished jewelry pieces. This would help Mesopotamians keep up with the growing exotic tastes of the upper crust of society. Now, because most jewelry craftsmen were of the lower classes in ancient Mesopotamia, and made very little money, they did not have the means to obtain the materials they needed from as far as 1,500 miles away. Such craftsmen belonged to government-controlled guilds that acted as liaisons between them and their local royal palace. It is clear that after the rapid growth and development of cities like Ur of Sumer, Akkad, Babylon, and the Assyrian Assur and Nineveh, the wealth of aristocrats there and their demand for luxury goods increased, turning the business of jewelry into an entire trade network, a commercial enterprise that required the teaming up of the lower classes with the greatest powers in the land-the government. Mark Schwartz, an expert featured on an Ancient Warfare Magazine podcast, “The Assyrians at War,” gives an example of how trade worked. He points to the old Assyrians living under the merchant system obtaining gold from Anatolia through the export of textiles (scrub to the 11:25 point in the podcast to hear this). Although when we talk about ancient Mesopotamian jewelry we are referring to jewelry produced by Sumerians, Akkadians, Babylonians and Assyrians alike, it was really the achievements of the Sumerians in jewelry making that we marvel at the most. It was they who who wrote the opening chapter for jewelry making, not only for other Mesopotamian civilizations, but also the ancient and modern worlds. How wonderful! So glad to be of help! Wow! Thank you! It’s quite flattering to know we beat Wikipedia. May you get an A+++ on your project! There are many more sources, but these would be good places to start.